I didn’t set out to write about Bluetooth train control. I just wanted to see if someone was using bluetooth, so I could promote the Wrist Rack as a great way to operate trains handsfree. Once I delved into things, the possible impact of the brilliance and simplicity of bluetooth model train control became apparent. As TrainTalk TV host I’ve spoke to literally thousands of model railroaders over the years. One common subject amongst them all is the decline of the hobby in recent years, and the lack of ‘new blood’ joining the hobby or train clubs to bolster the numbers. Might I humbly suggest that the answer is here, is quite simple, and is very easily promotable to an audience that should be somewhat more receptive than it’s been in the past. I’m going to skip over all the great stuff that bluetooth train control does or is being developed to do, and focus on two criticaly important facts. 1. Bluetooth train control drastically reduces the cost of entering the hobby of model railroading while making it simpler than ever to get involved. 2. Bluetooth is easily accepted by younger generations. They understand it already, there’s no education or ‘hard sell’ required. As the video shows, Bluetooth is an obvious choice for simplifying operations at train shows. My ‘run it anywhere’ experiment was an outstanding sucess. So, what is Bluetooth train control and why is it different? 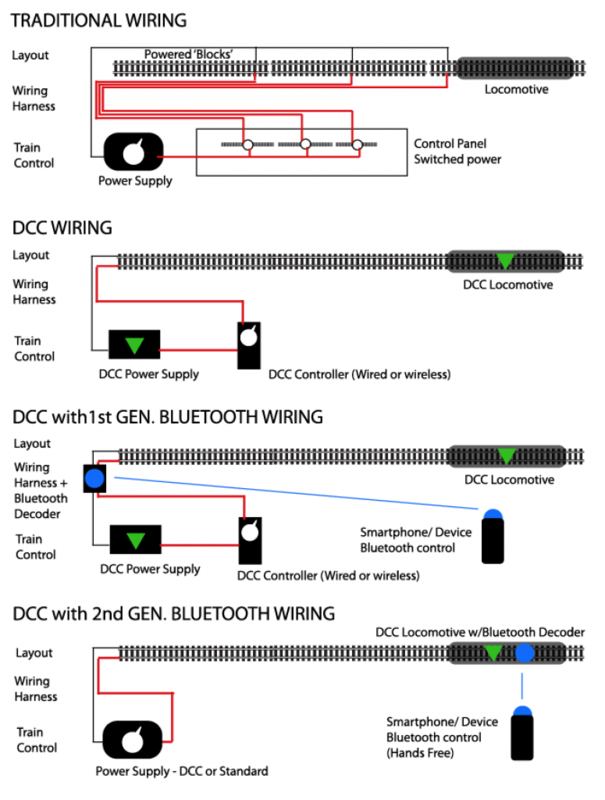 Here’s a simplified graphic and some explanation of what I’ll call 2nd generation Bluetooth Train Control. Model train control has evolved for decades and until now, had gradually become more and more expensive. In the past, powered block control meant wires everywhere, with a series of switches to control the power distribution to make it all work. The advent of DCC control made for incredibly realistic train operations and simplified the wiring issues, but now required an expensive master power unit, handheld controllers and special DCC equipped locomotives to work. Even so, it has since become the standard of most hobbyists and clubs. Some manufacturers recently offered what I’ll call a ‘1st generation Bluetooth’ control, augmenting their handheld controllers with an App on a smartphone or tablet device. This is a good step, but still requires the DCC power supply and the addition of a special bluetooth decoder unit. The ‘2nd generation’ of Bluetooth train control offers a whole lot more for a whole lot less. You still need a power supply, but not neccesarily a specialized DCC supply. You still need DCC equipped locomotives, but most of them are shipping that way now anyway. The only other thing you will need is a Bluetooth chip in the locomotive to accept the signals from your bluetooth smartphone or device. The technology is still evolving, but kudos to Bachmann Trains for offering a line of locos with the fledgling technology built-in and especially to BlueRailTrains.com, the current technology leaders in this feild. Although it will be awhile until we see this in everyday use for all scales and gauges, if we as model railroaders are smart enough to embrace this new technology, we may find we have a lotmore time to spend on other aspects of the hobbly and that we have a new generation of hobbysists to educate in those finer points. Next Topic: Win tickets to the Vancouver Train Expo!